I remember when I was a child I refused to eat quail, I didn’t like the idea of cooking a bird of that size. I got older, learnt that there is no difference between eating chicken, quail or any other fully grown bird and then one day, I tried a piece of its juicy meat. I was convinced within seconds! I have since tried out many recipes, fruity with roast grapes, quail with different herb variations, pure and buttery, exotic quail with various spice mixtures, so many possibilities that change with the seasons. 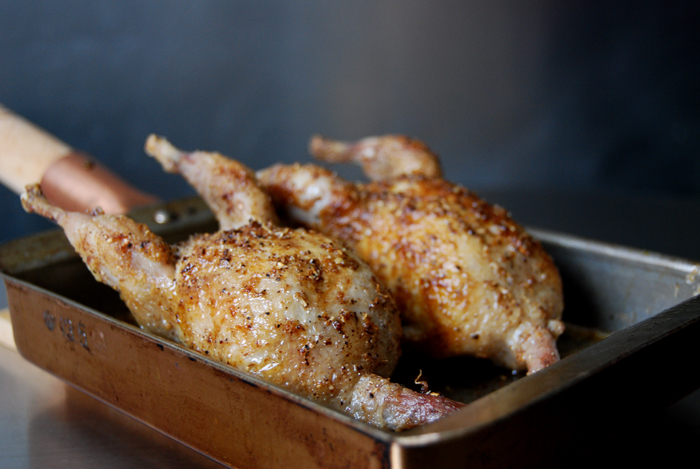 There’s one thing these recipes have in common, I always fry the quail in fat with a piece of garlic and then I roast it in the oven for 8-10 minutes. It makes the skin crisp and the meat doesn’t loose its juices. You can play around with quite a few aromas because it tastes so strong, it allows you to be more experimental than with chicken. I love to look through my big box of spices and follow my nose to choose the right mixture. It makes me feel like a child in a sweet shop! This time I go for 1 small star-anis, 2 cloves, 12 black pepper corns, 1 teaspoon of coriander seeds and 1/4 teaspoon of aniseed, everything ground coarsely in my mortar. This spice mixture makes the crust for 2 quails. I had some goose fat in the fridge, perfect for frying poultry but you can use butter instead. I fried the birds together with 1 clove of garlic cut in half until their skin was golden brown on all sides and put them into a baking dish. The buttery juices mixed with a dash of lemon juice go over the quails, followed by the spices rubbed into their skin and some salt. Now they just need to go into the oven, set to 200°C / 390°F, I used the Rotitherm roasting setting which works perfectly for poultry. Mine were done in 8 minutes, I had bigger quails which needed up to 15 minutes depending on their size. 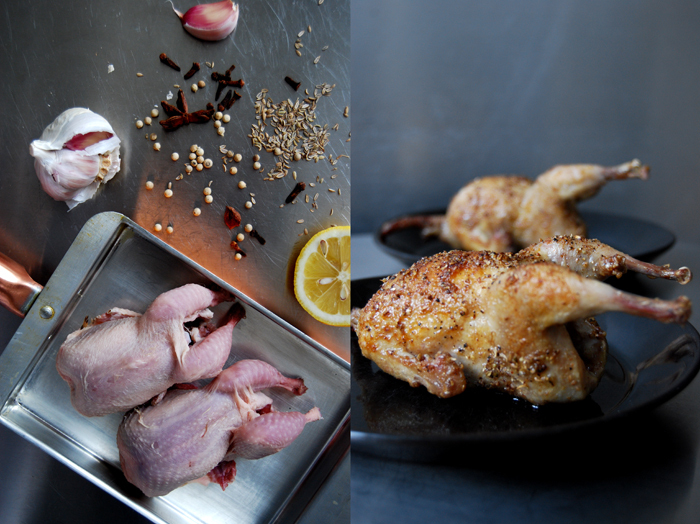 We focused on the quail and enjoyed this meal with slices of white bread to dip into the spiced juices and a salad on the side. i always enjoyed quail, but fell crazy in love with it when i moved to texas and kept running into buttermilk-battered deep-fried quail. you are making me rethink that dish by throwing star anise and aniseed curveballs at it. yeah? oh yeah 🙂 i will try your roast spiced version first. Beautiful pictures Meike! 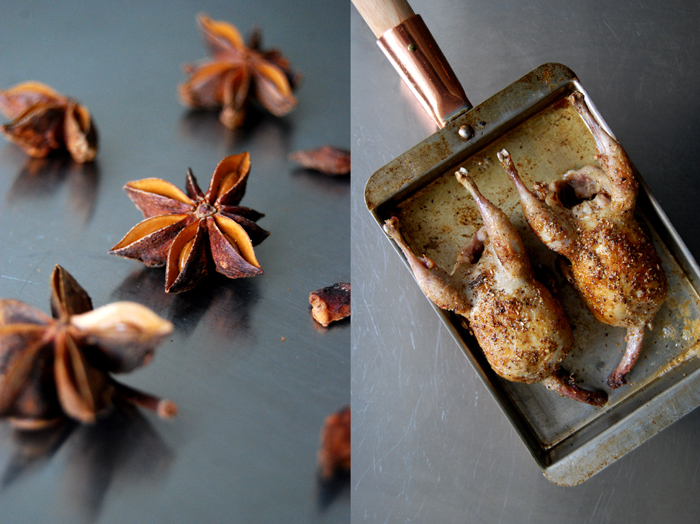 I love eating quail but it’s not something that I ever think to make at home. This sounds wonderful though and I can’t wait to give it a try. Thanks Kathryn! You should, they are quicker to make than chicken. It’s a great lunch, but I also love to make it as a starter for a dinner party. They really sound more extravagant, their preparation is so easy!